Despite economic uncertainty, and against a backdrop of unspectacular overall retail sales, retail ecommerce in the UK will post strong growth during this year’s holiday shopping season in November and December. Digital’s role in Black Friday sales and the growing influence of mobile will be key drivers. Overall retail sales for November and December will post only marginal growth over the same period in 2015. However, retail ecommerce sales will see impressive growth of 15.4% to reach £16.90 billion ($25.83 billion). The effects of Brexit aren’t expected to be felt during this year’s holiday shopping season. While the UK’s economic future remains somewhat uncertain, current sentiment is that consumer spending surrounding Christmas will remain unaffected. US-import sales days Black Friday and Cyber Monday are becoming increasingly influential on how and when UK consumers shop during the season. 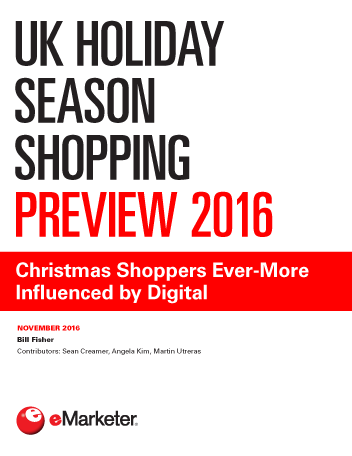 Mobile’s growing influence on ecommerce continues to be felt in the UK, and especially at Christmas. Transacting via smartphones, in particular, is becoming more common. By 2020, full-year smartphone mcommerce sales will outstrip tablet commerce sales for the first time. Today’s channel-agnostic consumer is becoming more demanding, particularly at Christmas, and those retailers most willing to embrace both offline and online worlds are the most likely to succeed. "Retail ecommerce sales for this year’s Christmas holiday season from November to December will reach nearly £17 billion ($26 billion) in the UK and will account for over one-fifth (20.3%) of all retail sales during this period—almost twice the proportion of that in the US."